The wedding is an auspicious event where two people get bonded forever, so it becomes imperative to make it best in all possible way. Today Strap Themes wants to be a part of your or your relatives dream wedding by sharing great Word Press themes. Wedding websites are a bit unique in its kind with some special features according to the requirement. These days wedding sites are very popular and help you in making your wedding day memorable and grand. The pre-wedding shoots and wedding shoots are being captured in many weddings; these shoots can be easily incorporated into your websites by these fantastic wedding WordPress themes. 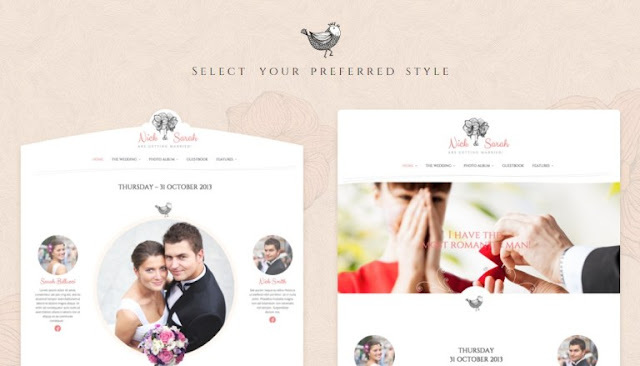 These themes are gorgeous and elegant for your marriage websites. These themes can be used by event managers, wedding couples, family members, etc. for building wedding sites for inviting the guest and informing them the details of the ceremonies. It has every possible feature you could think off like post layouts, a gallery that can play videos, sliders to see the journey, clean and modern design, responsiveness while using on smart devices and much more. Plan correctly for your special day by these wedding WordPress themes shared in our today’s post on “Best Wedding WordPress Themes.”WordPress theme is perfect for Wedding, Engagement and other event purposes. The Wedding Day is a lovely, responsive theme. It is perfect for your wedding event. It comes with RSVP Form, Countdown, and Guestbook. It has free video tutorials for beginners so be hassle free and follow the videos to learn more. Help Desk of This theme with one on one email and ticket support and dedicated support staff ready to assist you. Theme skin switcher comes with four predefined skins. A Plenty of Shortcodes is present. The Wedding day theme includes Custom Shortcodes that allow you to add buttons, lightbox, icons easily, drop cap, divider, styled list, tooltip and more to your posts, pages, and widgets. This theme is elastic with page builder, 40+ shortcode, 500+ Google fonts, WooCommerce. Elastic is minimal and elegant WordPress theme perfect personal wedding website, wedding organizer and wedding company websites. The elastic wedding theme is modern and very attractive for website purposes. This theme is compatible with browsers like IE10, IE11, Firefox, Safari, Opera, Chrome. PSDs files are also included in these themes. It has key features like Retina Ready display, Portfolio, Blog Testimonials, Menu Manager, Auto Image Resizing, Custom Widget, Simple and Unbranded like Theme Options. This theme provides elegant and modest designs for making your dream wedding plan memorable and unique. This theme can be used for engagement, wedding, and other event purposes. Its stunning beauty, fashionable, clean look, and proper execution accompanying with making use of Visual Composer, WooCommerce, WPML, The Events Calendar and Revolution Slider plugin, will help you to get an excellent wedding site for your happiest day. This theme is perfectly compatible with all kinds of resolution as Everline supports RTL which automatically adapts to the screen size used. Cherished wedding theme includes modern designs which go exactly the way any wedding couple dreams for their wedding plan to look like. This theme has a clean and manageable display. It is beautifully hand crafted responsive wedding WordPress theme with an extensive collection of native WordPress features. The display is compatible with all screen resolution of different kind of devices. Cherished integrates with Instagram Feed plugin which allows you to display beautifully clean, customizable, and responsive feeds from multiple Instagram accounts. The ultimate theme which comes with tons of features to make it easy for you to setup your wedding site. It comes with unlimited color variations and has a responsive layout which is highly customizable. There are nine additional page templates that come with Merit theme; they are Homepage, Blog (Normal), Blog (Grid), Gallery, Events, History, Accommodations, Guestbook and Full-Width page templates. Neeqah is easy to work with and includes features like Custom logo & favicon, prettyPhoto lightbox, Filterable gallery, Homepage slideshow, AJAX RSVP form, Relationship history powered by History post type, XML demo content, WordPress Theme Customizer support. Elegant and modest, Emma is a theme designed to display your special occasions’ details with stunning beauty. With a fashionable, clean look and proper build execution, Emma is real, a good wedding theme that takes just minutes to setup. It is Compatible with the free Bean Registry Plugin, Bean Shortcodes Plugin, Bean Tweets Plugin, Bean Instagram Plugin, Bean Social Plugin, Bean Pricing Tables Plugin, Bean 500px Plugin, Bean Dribbble Plugin. It includes standard features which help the designer to create the wedding website easily. The customization of the theme the way you desire is easily possible. Drag and drop builder, the happening countdown timer, RSVP form, Guestbook, etc. like features of Honeymoon wedding themes make it accessible and easy to work with. The honeymoon is a lovely, responsive wedding theme. It is perfect for your wedding event. It is so elegant and provides endless possibilities of layouts which are easily customizable.Unlimited styles, high-speed performance, excellent customer support, event calender, multiple footer styles, 600+ Google fonts, Translation ready, Wedding guestbook, etc. like features make honeymoon theme remarkable. Just Married is a stunning, friendly and easy to use wedding WordPress theme for any lovebirds that are planning to get married. Crafted with pixel perfect details, it consists of retina ready display. This wedding WordPress theme will let you document and share your wedding experience with your friends and family. Just Married comes with four pre-made styles that can be switched at a press of a button directly from the WordPress admin: Beige, Blue, Green, and Purple. Just married comes with a bunch of built-in page templates for you to use. The Fuse Framework is the backbone of this theme which provides you with lots of settings and features that control the look and feel of the entire theme. The theme comes with a contact form module that will enable you to create any contact which proves to be of immense help during the event. Sweetly wedding theme is the beautiful and sweet theme used for making wedding websites.This elegant wedding WordPress theme is suitable for personal, photography, portfolio and gallery sites. It’s highlighted features are Threaded Comment, Camera Slider, Multi Level Dropdown Menu, Cross Browser Compatible, XML sample data, Well Documented, PSDs files Inclusion, etc. It is easy to use, even if you don’t have prior experience of website designing. It is the perfect value for money wedding wordPres theme available at such low cost. Marriage wordPres theme is responsive, customizable, easily compatible with other devices including mobiles and tablets. The themes have a custom admin panel from where you can easily edit the main settings, change colors, modify the layout, for further reference just read the HELP file to understand better how to do it. It has dynamically built the layout using the smart editor shortcodes . It includes eight predefined colors for graphic elements. Much more is awaiting with this theme, visit and get your wedding website done your way. Get the best out from our above list and make your dream wedding successful with Our resources! For more keep visiting.